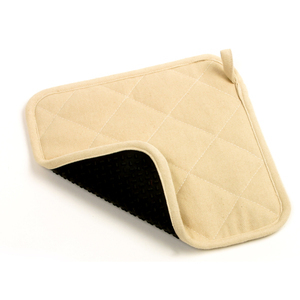 This black silicone pot holder with beige fabric serves double duty as a trivet for the table top. Spare your hands and furniture from exposure to hot pots and pans. The pot holder has a non-skid, heat resistant silicone surface on one side and fabric on the other. Featuring silicone raised grooves, this pot holder is ideal for gripping. Silicone is high heat resistant up to 485F/250C.